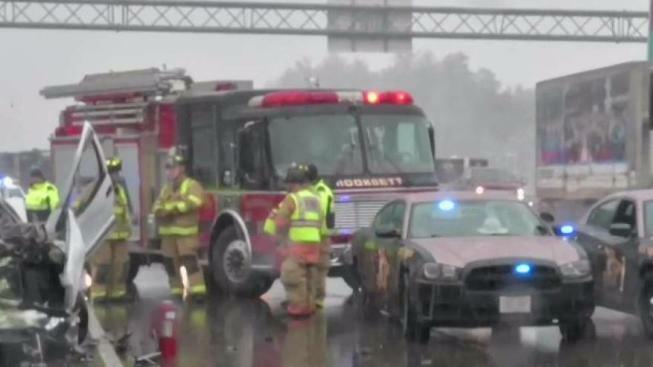 A deadly crash impacted traffic Friday afternoon on I-93 south in Hooksett, New Hampshire. Police responded to a fatal crash Friday afternoon on Interstate 93 in Hooksett, New Hampshire. State police confirm a preliminary investigation revealed a Chevrolet Tahoe rear-ended a tractor-trailer on the southbound side of the highway, just south of the Hooksett tolls. The driver of the white Tahoe, which had no license plates attached, was declared dead at the scene. The tractor-trailer driver, who has been identified as Abbas Al-Ramahi, 55, of Missouri, was not injured. The right two lanes of I-93 south were closed at the tolls for 3.5 hours following the accident, causing a major backup. Anyone that has information related to the crash is asked to contact Trooper Travis Merritt at 603-666-3333.